Share the post "Rustic Meets Nautical"
Rustic meets nautical! You can evoke the spirit of the ocean while giving your bedroom a cozy, cabin-like feel, which combines the blues of the sea with rustic wood furniture. All of this can easily be found under one figurative roof at Cabin Place. I’d love to incorporate an on-trend nautical theme bedroom with a classic “rustic escape” appeal. Since I love the cool shades of blue, I have been thinking about my master bedroom needing an updated color palette and finishes. I’m thinking of adorning it with aqua walls, complementary turquoise window treatments, and turquoise accents. Barnwood is no longer reserved for barns anymore. It’s now a simple and versatile way of adding rustic and practical sensibility to any modern theme. You can easily incorporate the look of barnwood in a rustic nautical theme by starting with the bed. Barnwood beds are solidly built, very high quality, and can adapt to a variety of styles. Cabin Place will surely spruce up your bedroom with their varied selection of barnwood beds, including this Barndoor Style Barnwood Bed ($1389.99 – $2049.99). The Barndoor Style Barnwood Bed is meticulously crafted from reclaimed Red Oak from 1800’s tobacco barns that features a traditional plank design. The dull catalyzed lacquer finish adds to the wood’s natural allure. 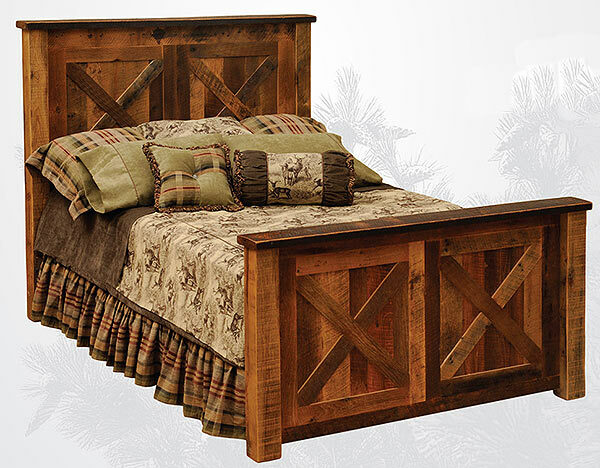 The rustic nature of this bed is quite a showpiece! Since the style of the bed makes such a statement, you certainly don’t want other pieces vying to be the focal point of your newly furnished bedroom. 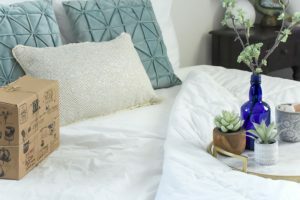 The right bedding set can make a dramatic difference in a bedroom! Cabin Place has a wide selection of nautical and coastal bedding sets. 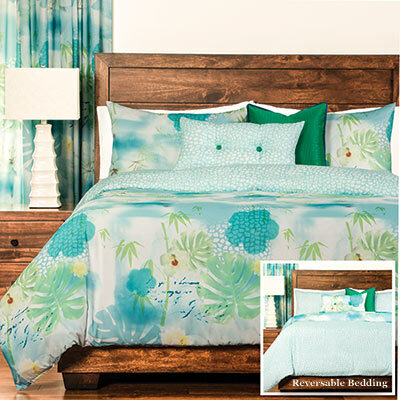 One of my favorites is the Tropical Botanicals Bedding Set ($179.95 – $319.95). The Tropical Botanicals Bedding Set lends a modern vibrancy to the bedroom. It boasts a lively watercolor design that’s beautifully accented with a chic floral pattern and a subtle blue leopard accent. Alternatively, you can reverse it to a soft leopard print design. The unexpected details of this bedding set are a perfect example of how thinking outside the box can add even more charm. You can add more visual punch, while keeping the serene and restful theme intact with accent throw pillows in a rich hue of emerald green or dark blue. The latter will bring out the color that’s least used in the color combination of the bedding set. It’s all in the details! nightstand futures one drawer on the top and an enclosed storage base at the bottom, which is perfect for storing your bedtime reading materials, hiding the remote, or even stashing your favorite candy. Concealed European-esque hinges keep the look clean, uncluttered, and simple. 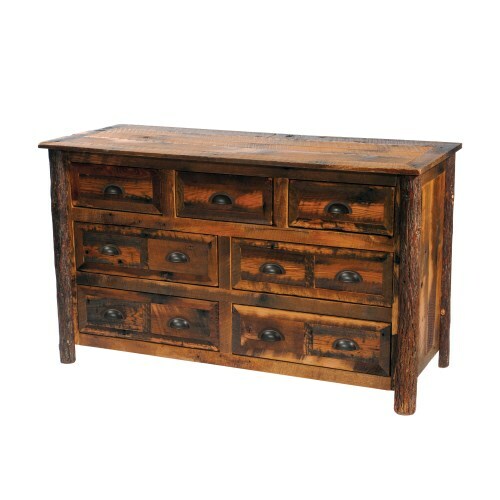 Lastly, you can seal the deal with the Barnwood 7 Drawer Chest ($1,449.99 – $1,679.99). Brilliant blooms tucked inside an ornate blue vase atop the Barnwood 7 Drawer Chest, decor wise, would be the cherry on the top. Cabin Place’s rustic chic and authenticity furniture has made it one of the top destinations for shoppers looking for something unique and different. Cabin Place’s furniture and décor can help us completely transform our bedrooms, living rooms, and even our bathrooms! Personally (as I’m sure you could tell) I’m excited about this sleek and stylish new take on nautical, rustic life. This post is in partnership with Cabin Place. My bedroom furniture is SO LAME. I would love a rustic looking bedroom. I love these would rustic furniture. It’s a little bigger than what I like but I do like the rustic look at it. Love these pieces of furniture – I love dark wood so this is just perfect. Something so homely about it and I would love these pieces for when I get my own house. Thanks! I love love LOVE beachy themes. I would never leave my room if it reminded me of the beach. And pairing it with rustic cabin pieces? Absolute perfection. This is beautiful when paired with the lighter bedding. I would even use the dresser as a media center in the living room. I love everything about these pieces! Rustic Nautical is the look I have gone for in most of my house and I love it. The dresser is gorgeous and I bet it holds a ton of clothes! I love the wood furniture! Very rustic and natural looking! Now if only I had the space to fit all those pieces! Thank you for sharing! Cabin Place sounds great. I love rustic designs and that bed is truly beautiful. The rustic furniture is also awesome. 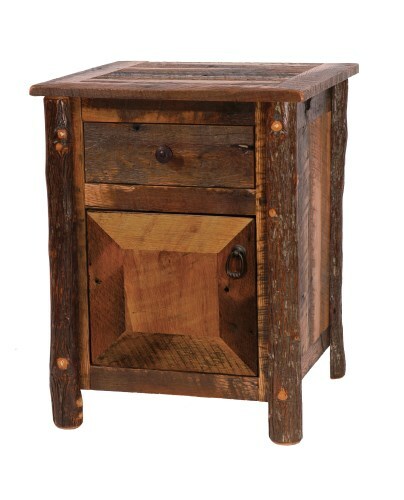 I really love this rustic furniture to my house. I bet my visitors would love this, too. I absolutely love the first photo. There is something so refreshing about stepping into a place where the furniture is not streamlined and everything is rustic and wholesome! My son had a bed like that until recently. I love the rustic look.To me it just makes a space look so warm and inviting. It looks beautiful – great combination! 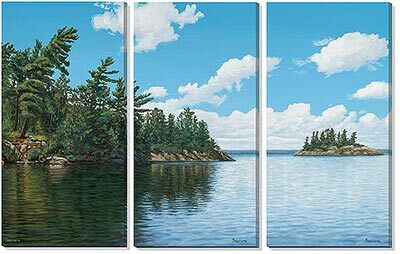 I love shades of blue like that, makes me think of the Summer and sea – two things I absolutely adore. Love that bed! I never really thought of our bedroom having a theme.. unless ” purchased at ikea” is a theme! LOL!! Nautical is such an interesting choice to go with because there are so many different ways you could go with it. 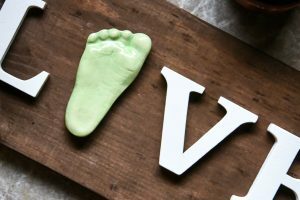 I love rustic barnwood and I LOVE that you are adding the nautical twist to it! This will be a beautiful room!! These all look so lovely. I love wood furniture and would fill my home with it if I could! The bed frame you featured here is just awesome! I love the rustic furniture! Now if I could just get a cabin in the woods to hold it 🙂 that would be lovely. My MIL loves rustic furniture. I will share this with her. She’ll love the beds, for sure. I love love love rustic! It is definitely something I think about when I start thinking about re-decorating. Of course, we hope to sell our house in the near future, so I don’t think we will be buying new furniture until we get our new house. I love the pieces you picked out here. I live in Florida, so the Rustic Meets Nautical look would be perfect for a home here! That last chest of drawers is gorgeous! Some great ideas here. I really like the rustic look of this furniture, especially the bed frame. I’m getting ready to move soon and have been thinking about what I want my new bedroom to look like and this has given me some great ideas. This bedroom furniture is gorgeous. It would look amazing in my room. I do need a new dresser. I love the colour of the wood its really cool and it gives it a vintage look to it, which I think is amazing! This furniture would look great in a lakehouse. I love both rustic and nautical styles as separate styles, but they also look great when paired together. Thanks for the ideas! Barnwood is so pretty. It has variances in color and looks casual enough for kids. I love the rustic furniture look. It looks old but classic! Love it! I love rustic furniture. These are really nice. This is some beautiful furniture, I’ve always appreciated the rustic feel of furntiture. I would love to have that dresser. The 7 drawer chest is gorgeous and looks like it could serve different purposes in a house as well. Beautiful furniture! I have always loved the nautical and together with the rustic look they just seem to go hand in hand. I love the floral sheets! I love these pieces. We need a bedroom makeover badly. We don’t even have a headboard! What a beautiful combination of styles. I actually think that they pair really nicely and give a comfy and cozy look! The barnwood used for the beds is really pretty. I could see us adding that to our bedroom. I love rustic furniture!!! Nate just made me a coffee table and I LOVE it! If you’d asked me 6 months ago I’d say I prefered modern furniture but after Hawaii vacation I LOVE anything beachy. That canvas would be great done with one of our photo’s of the Hawaii sunset over the ocean. Two of my favorite style combined looks perfect. Never knew they would blend so well together. This is very beautiful, I love it.